Welcome to the Wandering Wonderings of my life. I have searched and continue to reach for the sublime purpose that extends beyond the sensory perceptions of one's human awareness and identity. Along the way, I have encountered a graceful embrace of the unity founded in the tran­scendent eternity, which by nature may only be partially perceived in the experience of one's mortality. It has been a twisted journey. One self-determined by the lessons of life that I have needed to learn in order to enter into joy's fullness. I am neither proud nor happy about every aspect of my life. It has been a messy business so far with complex overlapping experiences that have ranged from boring to terrifying and from fairly satisfying to fascinating. In other words, life has al­ways presented me with a mixed bag of opportunities and activities. By His grace, it is now very good, and I wish to share with you the goodness of the life God has purposed for you. The only continuity throughout my remembered consciousness has been the deep spiritual quest for meaning - for a personal relevance that transcends myself and reaches out through my family to embrace all of humanity. It would have been relatively easy to embrace a meaningful purpose for myself as an individual, but there are all of these other people in the world, beginning with the very important family commitments and considerations and extending to the unknown you. Sooo, I am just very thankful to still be alive and learning and have labored over these words in an abstract and unknowing love for you. My journey continues. It is not alone and has never been so. The time is now right to reflect and share my incomplete, and therefore, a naturally lim­ited set of observations and conclusions with you. Even what I have submitted here to electronic publication is incomplete, but I trust that you will find value in what is presented. Your feedback will help to complete this part of my own mission as I purpose to revise my efforts through logi­cal completion of each section. I organized Mission of One in three sections. The first is a dialogue on how religion in general, and Christianity in particular, have become impotent and irrelevant. It sets out my goals for unleashing the power of Jesus Christ through personal transformation to make a difference in this world. It focuses on what made the early church unique in the experience of humanity, which is also the key to understand­ing why Christianity has become less relevant to daily life in western civilization. The second section provides a biblical exposition of Christian mysticism, and the third gives some keys to practical application - how to live a spiritual life in the midst of today's skeptical materialism. When I was a young man, I came to believe that the impotence of modern Christianity was due to lost doctrinal truth, that there was too little congruency between biblical teaching and ecclesiasti­cal teaching. I also set out to discover the truths about science and theology, which led me to archaeological studies. As I wrestled with the issues of Creation and the Flood, evolutionary biology and geology as well as ancient history and archaeology. I continued in studies to corre­late the Bible with its sociocultural context and secular history. What I learned was that the Bible is a verifiably old book. It is also very easy to get lost in re­search: by "lost" I mean losing a total life perspective. In other words, beyond some rather broad strokes and fascinating details of understanding the Bible's general place in the ebbs and flows of civilization, a more precise verification of the Bible as God's Word academically is NOT going to make God any more real to people today. Any close reading of history testifies to the truth of this last statement. "Today" means now, and it means you and me. What has been lost is not doctrinal truth or more honest biblical exegesis. No, what has been lost is the power of God - the sense of His presence, the creative and healing power of His love, the sanctity of life and human life, a sense of holiness, the transformational victory of His grace, the eternity of His promise, the surety of Jesus' resurrection present in each believer, and the intervention of God in the historical affairs of man­kind that changes the course of civilization. Ten years have passed since I published my first book, God Is Not a Slot Machine. I am currently revising it in order to give it a focus more appropriate for the decades to come. This book deals extensively with our spiritual relationship with money and is set in the sociocultural history of the biblical revelation. It is the most complete and honest discussion of tithing and giving from the full perspective of the Protestant Bible that you will find in popular literature. Although God Is Not a Slot Machine was not a great seller last time out, dozens have told me how much it helped them. The confidence engendered by this response has been enough to lead me to believe that my current ruminations may also inspire fruit in the improved lives of others. This work promises to be a much more personal exposition than God Is Not a Slot Machine. So much so that I may include some earlier written works in an appendix that document my jour­ney in consciousness from my youth. I feel that may be fitting, as I reach what I hope to be the middle years of my life on earth. Who am I? As I write this book, I am a middle class information technologist laboring away every day in a small corner of the international business world. Although I may continue to de­velop this profession, I haven't always been so mainstream in my external descriptors. And with God's continued grace, I expect further changes. That is what growth is all about. I try to em­brace it. Please do so yourself. A few final notes. In this book I do not purpose to judge any specific person, group of people, congregation, or church organization in any critical manner. Any identifiable reference in mind I note openly. If something seems to imply the contrary, then please understand that my opinion matters no more than yours in the ultimate affairs of this life. Take the material presented at face value. Please accept, integrate and apply what seems good to you. Hopefully you will do this in re­sponsible context. I do not claim any divine exclusivity for the material content of this book because all I know I have learned from others. My unique contribution must be found in how I have learned and pre­sented it. On that basis, I copyright this book. However, I do want people to use it, and general permission is granted to reproduce pages and sections for non-revenue generating purposes. I wish to thank the many teachers I my life: the people and circumstances I have encountered whether they have been titled teachers in a formal educational setting, or not. I particularly in­clude my immediate family. Special recognition is due to M. Scott Peck through his writings and workshop work with the Foundation for Community Excellence. The Hebrew University in Je­rusalem runs an excellent Archaeological Institute. I owe much of my feel for antiquity to my undergraduate and graduate studies there. Without exception, my professors were professional in every way. The evening MBA program at the University of St. Thomas in St. Paul and other Twin Cities locations was also excellent. It is my mission to promote peace and Godly sufficiency to all I meet: first to my family, second to my neighbor at home and at work, and lastly to my community - religious and secular. May this be an example to the broader culture and the world as God wills. I remember that to help others, the mote must first fall from my own eye of life's conduct. Support myself and my family = financial sufficiency. Share the spiritual gifts I've been graced with. Remain physically active and healthy. Foster artistic expression for myself and by my family. Share the opportunities and knowledge of material success I've learned. All the above to be done by His Spirit of Love, not by my power or by mortal might. Support her both psychospiritually and financially. Support her without creating dependence. A great marriage with their mother. Secure home in a good neighborhood. Balanced guidance and help, spiritually and otherwise. The existence of love is the greatest proof that God exists. From the secular materialistic perspective, true love is irrational and serves no purpose. That God designed life's cycle of biological begettal and specific survival collective to include physically promoting care and concern for offspring, relations, and neighbors is but collateral support for this proof. Love is a miracle to be celebrated. Life is the reason to love. But love requires conscious and willing sacrifice. Do not seek wealth. Do not seek poverty. Give up the search, and therewith be content. Rather, seek peace and opportunity to efficiently/maximally serve in happiness discovered. Ask, and you shall receive your needs and over, for God is abundance in well-being. Well-being is more than material money and the passing power it represents. Well-being is spiritual balance in service above self to God through the humbling opportunities provided by ONE's fellow man - brother and/or enemy. To each is given stewardship of the abundance bestowed: we are judged by how we utilize our gifts. We are responsible for our families, our neighbors, the poor, but true charity does not impoverish the giver. It abounds towards all in autonomous reciprocity, balancing unlike equivalents, that is equivalents from different realms or natures or kinds. The solution to human problems, be they individual or social, is to proclaim grace to them and so overcome them. Problems can not be eliminated, only overcome. John 14:1 "Let Not Your Heart Be Troubled..."
You believe in God. Believe in Me, His Body, His Temple of Congregants: where the peace of God passes understanding, reason and ra­tion; where love reigns supreme and forgiveness is her rod and only the truly repentant has com­munion; where the power of My Holy Spirit runs free, and none do hinder the wonder of Her healing. Enter it early through the praising gates of my peoples' mouths. My kingdom is at hand: enter ye my fellowship. Open your heart to my healing wind of purging fire. Let the chaff burn: your fears, doubts, greeds, lies and both sins of the flesh and sins of proud intelligence. Wander not far from my Word. Yeah, you come to My Father through Me, but you rest and remain in fruitful growth in fellowship with others who also believe. (1John 1) If you know Me, you shall know My true members: for their light cannot be hidden, neither can their fruit be denied. He who has known My Body has known Me. He who has known Me has known My Father and himself. God is love, and life is a journey to become this truth in Yeshua HaMashiah, Jesus Christ. The rest of the discussion is but an aid in understanding that love is God. Unfortunately, what is helpful to a few may often be confusing to the many. This short theological statement is pur­posely brief. It is meant only as a rough guide to help ONE recognize the truths and teachings of God as presented in my writings. Truth is found in the Bible. But this book also records lies, and its truths are subject to distortions. The Bible communicates in accordance with an individual's or a groups' state of heart. God is revealed in the Bible as well as in other literary works. The chief difference is that the Bible makes promises to those who will take them up. Promises that ONE can count on, for it is God's covenant contract with Israel and with all of mankind. More importantly for this book's purpose, God is found in life's interpersonal experiences at the time when ONE can stand aside mentally and receive Him. God, truth, love - these are the ultimate realities. As such, they need no defense, for they simply are. Truth is also discovered through our experience of life. The difficulty comes from the necessity of experiencing God in the context of being born "unasked for" with a mortal identity derived from an indivisible blend of "good and evil". Mankind is left no choice but to dwell in an imperfect world of rare beauty, common indifference, and irrational cruelty. Too few find the way, and too many live in fearful pain and guilt. Others manufacture arrogant ego-worlds of unreality to protect themselves from fearful pain and guilt. Of course, the latter are quick and capable of defending themselves and their blustery constructs. I have attempted to follow a different path. You know, the ONE that "has made all the difference." It is hardly unique, but for each of us who have found it, it is a wonderful journey of self-discovery. It bears the excitement of seeming to be something completely new and unique to ourselves. Which it is. But, of course, it isn't. This is good because it means that we may have the opportu­nity of sharing it. Through sharing, we discover even more personally, and just perhaps, the "other" shared with might gain some insight as well. This characteristic of immediate and unplanned for reciprocity is a vital characteristic, or identifying sign, of love's presence or fruit. Great peace have they who love thy law, and nothing shall offend them. The way of God is unique to each person, yet it is also ONE and the same to all. "There is ONE faith, ONE hope. . .ONE spirit." In the end it is in the reality of the Presence of the ONE God, the Holy Spirit, that the unity of peace can be found. Before that Presence all mortal strifes dissolve because divisive human pride will crumble to scatter like fine ash before the winds of a repentance that derives from the acknowledgment of ONE's mortally bound sin by nature of being. Humble unity is only given life by love flowing from the forgiveness accepted in our Savior's true sacrifice. No man can indeed judge another, for Torah's path is but dimly plain to each. All perceived truth, BE IT DOCTRINE OR PROPHECY, must bow before the absolution of God's Presence evidenced by the high fruits of His Spirit: forgiveness, faith, hope, humility, love, peace. During this short walk on earth we can at best only know in part or serve imperfectly the Perfect Master. It is a true miracle to be still in heart, when the briefest pure flashes of God's intense Light may shine within the dull lamps of our flesh, glimpsed but briefly by another out of the cor­ner of his or her own dim eye. God is ONE. Let man stand aside and behold Him. My prayers are with you. God will bless Himself at work in His own Body. My passion has and is ever yet, God's fullness for each and all in perfect peace and power. Accept His Will, and it shall be done in you. Reject it, and it shall be done without you. The earlier versions of this book appeared in various articles I wrote beginning in 1988. Their distribution was rather limited, and life took me into other directions so that I never felt that this book was complete. As I approached the completion of my latest book, digital spirituality, I realized that Mission of ONE needed to be published first because it speaks more directly to those oriented to biblical faith. Encouraged by a Ukrainian Jewish evangelist for Yeshua the Messiah and the reaction of three young students at Bethel University that I met sitting in the library, I determined to get my unfinished business out the door because it will never be finished. It is what it is, and I believe that the reader will benefit from its reading. 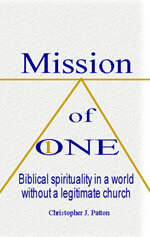 So I made a few minor edits in 2008 and published Mission of ONE on the Internet with on demand versions to follow. I have loaned the rights for this activity to the nonprofit foundation I head with thanks Herbert R. Stollorz who funded its startup and operations to date.